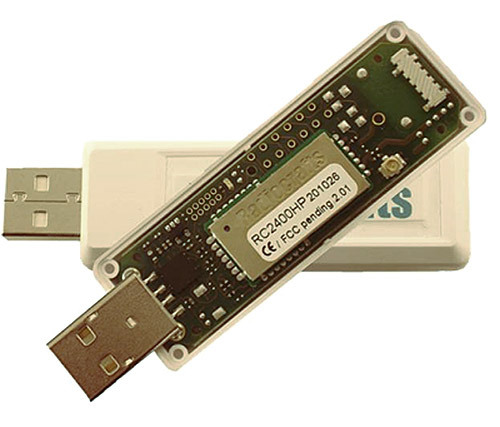 The USB-sticks from Radiocrafts are designed to provide an easy to use network node for development, prototyping or simple networks. The USB-stick is the only hardware needed, together with a PC, to build nodes for prototype networks for any radio protocol supported by the Radiocrafts RF modules. The USB-stick includes an USB connector, an RF module, a programming connector and an integrated antenna. The integrated antenna provides a very compact form factor, but does have limited antenna gain compared to the antenna included in the Radiocrafts Development Kit. This means that range is somewhat limited and that the USB-stick should only be used where long range is not required. 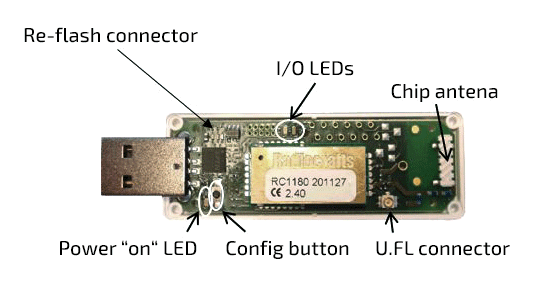 The USB connector is the interface to the Radiocrafts PC tools, from which the RF module in the stick can be configured and also be used to send and receive data from the terminal window on the PC. The integrated antenna provides radio connectivity on 433 MHz, 865 MHz, 868 MHz, 915 MHz and 2.45 GHz respectively. The RC11xx / RC2400HP / RC2500HP family of USB sticks contains an RF module from the wide selection of Radiocrafts modules, together with an USB level shifter, an USB type A connector, and an antenna. All fits inside a transparent plastic enclosure for visibility of embedded the LEDs. The re-flashing connector is used for RC2400(HP) program development when connected to a CC debugger, or for firmware upgrade of any other embedded module, after an explicit agreement with Radiocrafts. FOR ALL MODULE INQUIRIES, PLEASE CONTACT RADIOCRAFTS SALES TODAY!